On the very last day of 2008 I braved the cold, wind, and icy precipitation to get one last bird for my Anti-Global Warming Big Year, and the last bird was a doozy. 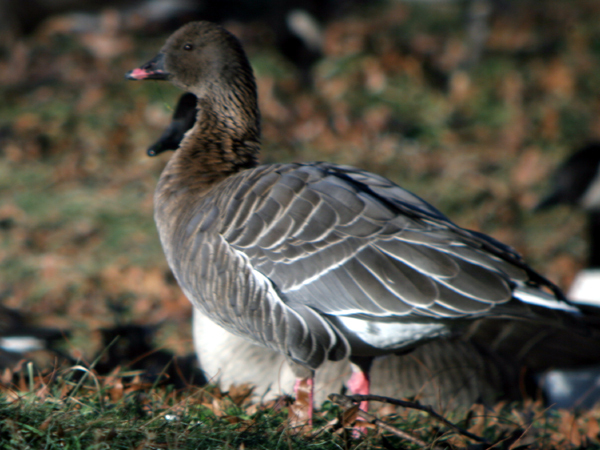 The Pink-footed Goose is a vagrant in North America, and should be somewhere in Europe right now. The one that was first found in Kissena Park just before Christmas has stuck around, but on December 31 when I woke up and checked my email I discovered that the bird had been found in Flushing Meadows Park. And though I hadn’t really planned on birding because of the nasty weather forecast I managed to drag my tired self out the door and to the subway, where a quick two-stop ride led to a ten minute walk to Flushing Meadows Park. Prior to December 31 I had seen a Pink-footed Goose exactly once, in fact, it might have been my 300th bird in New York State in 2007. But it was still a shock to see the gorgeous coloration of the bird through the brand new Swarovski binoculars that have recently come into my possession (more on that later). And it was even more wonderful that I broke in the brand new Swarovski spotting scope by looking at the Pink-footed Goose. Seriously, how many North American birders can say that the first bird they looked at through a new scope was a Pink-footed Goose? I bet I’m the only one. The picture above was digiscoped through my new digiscoping rig, which I am still learning to use. But even if I was an expert I doubt I could have done much better considering the lack of light caused by the overcast skies. The fastest shutter speed I could use was 1/20 of a second, and that is just not fast enough. How come lately whenever I am seeing a rare bird there is no sunshine? Despite the lousy lighting, lousy weather, and lousy walk home in the ice-cold wind I left Flushing Meadows Park satisfied with my final total for my mass-transit enabled big year. I might have fallen well short of my goal of 250 species, but I saw lots of good birds and had a fun time doing it. And isn’t that what counts in the end? Pre-publication update: I couldn’t resist going out to find the bird again on the much sunnier first day of the year to make the bird one of the first for the year as well. Pics of the Pink-footed Goose, which was hanging out in the middle of a cloverleaf interchange, taken in much better light, are below. This post has been submitted to Bird Photography Weekly #19. Go check it out! So what do you think, is it a wild bird and why or why not? Nice! That fine fellow was one of my first of the year as well. Great bird to have as a last and (almost) first. I tried several times to see the pink-footed goose, but I always laid a goose egg and missed it. I’m going to try again, and hopefully I can add it to my anti-global warming list which has stalled at 220 or so. @John: I just wish I had found the Cackling Goose reported in the same park! Great bird. I am always amazed how people can pick out one slightly different bird among a large crowd. Of course, those legs do stand out quite a bit.